We’ve come a long way and there’s still a bit left to complete our app. At the moment it feels a bit rigid and we haven’t implemented some of the intended functionalities. A key benefit of smart mobile devices nowadays is an ability to interpret gestures! We’ve already dealt with gestures while working with buttons. When we tap on a button, we perform a gesture and our button element handles this gesture. As usual, there's always more! Let’s explore what gestures we have available, pick those that will serve us best, and discover how we can handle them! Gestures are the way people interact with a touchscreen. In many cases, this is the only way they interact with the primary functionally of a device. Some of them can be single or multi finger - like tap, can be single- or multi-finger, when pinch or rotation must involve at least 2 fingers. How do we get our hands on all of it? To work with gestures we need to use gesture recognizers! In general, gesture recognizers are represented by 2 components - Gesture Recognizer and Touch. They are represented by the respective classes: UIGestureRecognizer and UITouch . UIGestureRecognizer and it's subclasses are sufficient to work with gestures as a whole - taps, swipes etc. UITouch is used when finer functionality is needed - like touch and move for example. Any gesture, simple or complex, ultimately can be described as a touch (or multiple touches) with variety of associated characteristics and processes. As we explored earlier in this chapter, there is an array of gestures available to using iOS. Each variation, for convenience, is represented by a subclass of the base gesture recognizer. In fact, UIGestureRecognizer is too general and id defined as an abstract class. Which mean it's rather an idea than a usable type and it must be subclassed. An abstract class defines all the necessary characteristics for potential subclasses which allows to ensure that all subtypes follow the same rule as the base, abstract, class. UITapGestureRecognizer: This class regards the tap gestures made on a view. It can be used to handle single or multiple taps, either with one or more fingers. Tapping is one of the most usual gestures that users make. UISwipeGestureRecognizer: Another important gesture is the swipe, and this class exists just for it. Swiping happens when dragging a finger towards a direction (right, left, top and down). A characteristic example of the swipe gesture exists on the Photos app, where we use our fingers to slide from one photo to another. 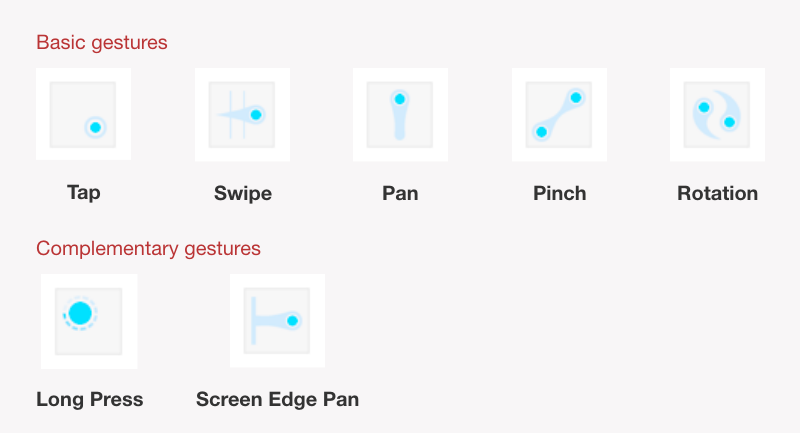 UIPanGestureRecognizer: The pan gesture is actually a drag gesture. It’s used when it’s needed to drag views from one point to another. UIPinchGestureRecognizer: When you view photos on the Photos app and you use your two fingers to zoom in or out to a photo, then you perform a pinch gesture. As you understand, pinching requires two fingers. An object of this class is usually handy to change the transform of a view, and more specifically its scale. Using pinch gestures for example, you can implement zoom in and out to photos on your own apps. UIRotationGestureRecognizer: In accordance to the previous gesture, rotation is used to rotate a view using two fingers. UILongPressGestureRecognizer: An object of that class monitors for long press gestures happening on a view. The pressing must last long enough in order to be detected, and the finger or fingers should not move a lot around the pressed point otherwise the gesture fails. UIScreenEdgePanGestureRecognizer: This one is similar to the swipe gesture, but with a great difference: The finger movement should always begin from an edge of the screen. Using Interface Builder to create gesture recognizers and provide association with the code by dragging the connection. Similar to the way we are creating outlets and actions. Programmatically - by creating objects and associations exclusively in the code. Both approaches are suitable. In practice, in larger projects (and consequently bigger development teams), programmatic approach is more common. Gesture object - Tap, Swipe etc. Associated element for the gesture - Tapping on an image view for example. Delegate for recognition action - an object that will handle the gesture - will perform some action when gesture has been recognized. Target - the action to perform. When creating gestures via Interface builder, the only thing we need to provide is the target. The rest of components is derived from the connection - the UI element we drag it from, the delegate is the code file we drag it to and the gesture type - what we configure it as we drop it before creating a target. Programmatic implementation, on the other hand, requires specifying all those aspects in the code. State - defined as property to reflect the lifecycle of a gesture - when it starts, finishes or gets canceled (abandoned). Touch object(s) - particularly description(s) of a gesture - force, positioning, speed, direction etc. Gestures are very broad and powerful segment of iOS development. in your career you'll come across a long array of variations of how gestures can be used. We'll start with the key gesture we need to implement for our app - a tap on image view to present image picking options - the alert controller we initially placed in share method to test out its functionality. Add a tap gesture recognizer to the image view. Assign an action to the tap gesture recognizer. In the tree of view controller elements the gesture recognizer does not appear near the image view. How do they know of each other? Let's test! :zorro: Run the app, click on the image place holder, you should get the image picking options action sheet! Now, click on 'Share' button - it shouldn't produce any visible effect! Great, and now, let's accomplish the exact same thing in code. We need to describe a gesture and attach to the target - the method we already have - changeImage(). We've declared a variable of UITapGestureRecognizer type. Set the gesture recognizer target to self - means our view controller should get notified when a tap is recognized. Specified action - the changeImage method. and, finally, added gesture recognizer variable to the collection of gesture recognizers associated with the creation image view. You can configure all the properties available programmatically. Feel free to explore all available options by typing tapGestureRecognizer variable and a dot ( . ) 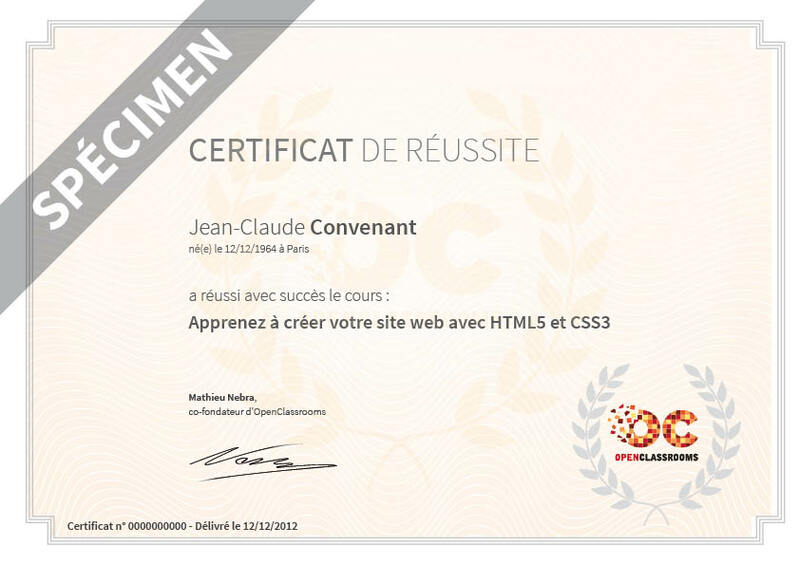 in your code which will bring a contextual popup exposing the full list applicable elements! Let's sweep the floor. 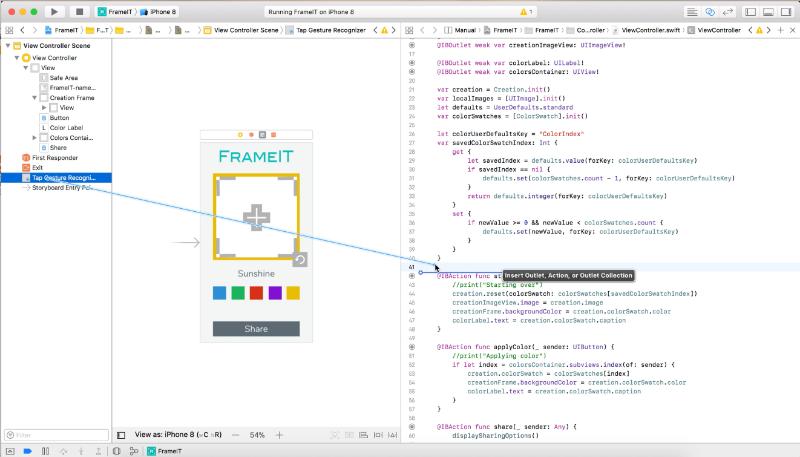 >_< We've got tap gesture recognizer defined in Interface builder and in the code. Pick one, remove the other! Up to you. Moving forward, we'll be implementing gesture recognizers in the code. However, it will not affect our current implementation if you chose to keep the IB version. To ensure we've got it intact, run the app again - make sure it still functions as expected! UIPanGestureRecognizer - to translate the movement. UIRotationGestureRecognizer - to manage rotation. UIPinchRecognizer - to process zooming in and out - scaling. If you test it now and attempt to perform each of the described gestures, you should get a respective output in console - one action per gesture attempt. Here's a trick - we need them function simultaneously (or at least zooming and rotating would be expected to go together)! So that when user is using 2 fingers to zoom, they may also want to rotate without letting go and perhaps even move at the same time. The function return true or false. This defines whether associated gesture actions are handled or not. 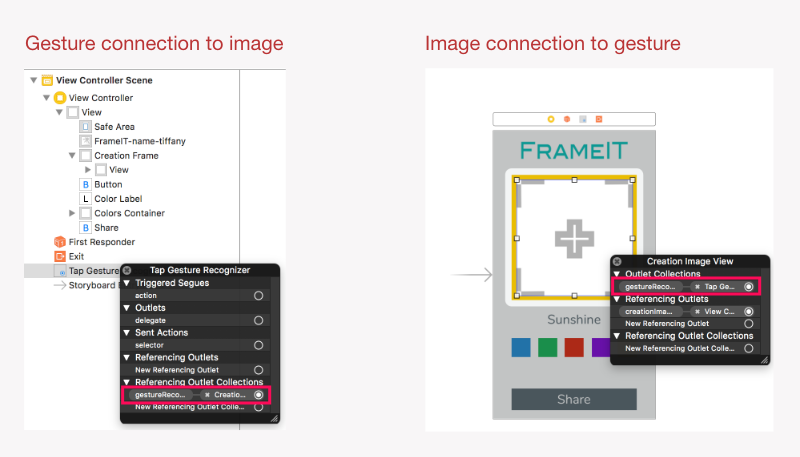 There are two classes for handling gestures in iOS UITouch and UIGestureRecognizer . UIGestureRecognizer and its subclasses make it easy to add classic gestures to an interface. Utilizing gesture recognizer comes down to associating a particular gesture with a UI element and connecting it to a handling target - perform an action associated with a gesture or it's particular state. Gestures can be followed by monitoring its state property that reflects gesture's progress. Particulars of gestures during all its states can be accessed view associated touch object(s). 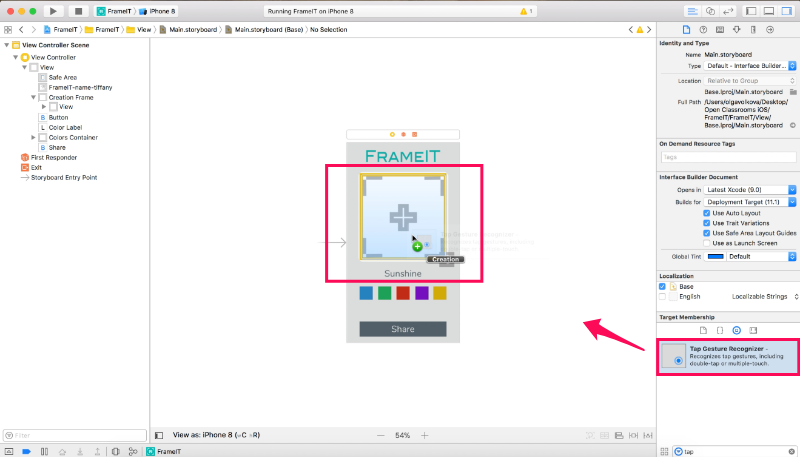 Activité : Make FrameIT even more fun!